Summer vacation means the kids get to curl up with a book, a plate of sliced mangoes, and drift off to Storyville. There’s plenty of exciting stuff happening in the world of books this summer. The new Rick Riordan is just out – The Hidden Oracle: The Trials of Apollo I, and then in July, Harry Potter and the Cursed Child – The Rehearsal Edition will be published in the muggle world. Here’s a list of books to add to the reading list this summer. Asmara’s Summer by Andaleeb Wajid: A spunky story about Asmara, a hip and popular teen who finds herself relegated to her grandparents’ decidedly not-so-posh place on Tannery Road in Bangalore for the summer. Asmara’s shorts are the cause of horror to her Nani, there’s that stuffy neighbor aunty to contend with, and worse, there’s no Wi-Fi! Asmara decides not to tell her friends about this one-month interlude in her life, so she’s pretty much friendless in the area, apart from Rukhsana who’s about her age. Things start looking up when Asmara discovers that Rukhsana has a gorgeous brother. While Asmara entertains herself by starting an Instagram account to poke fun at the fashion disaster of a neighbourhood, she also discovers that there’s more to life than the way people dress and talk. A breezy read, Asmara’s Summer is also warm and has moments that are wonderfully poignant. Hedon by Priyanka Mookerjee: Hedon is the story of the millenials. Tara Mullick meets Jay Dhillon at a wedding when she’s a teenager. An awkward, plump teen, that too. Soon she heads off to the USA to study, but she keeps in touch with Jay over texts and quick phone calls. Priyanka Mookerjee writes the story of the privileged – Tara goes to a posh school in Kolkata and then to a US college. She’s surrounded by money and yet it all feels pointless to her. Hedon is a story of debauchery, of existential questions, and of pop-culture. But it also talks about that feeling of alienation, the lusciousness of poetry, and just life as it unravels. Tanya Tania by Antara Ganguly: An epistolary novel by Antara Ganguly, parts of Tanya Tania are set in the early ’90s. Letters fly between Tanya in Pakistan and Tania in Bombay, talking about their lives, school, home, friends and boyfriends. In many ways, the two pen-friends are self-involved, writing more to share, rather than listen. But ultimately, finding comfort in words. And slowly, the letters begin to reflect the political and social tensions in both countries. A coming-of-age book, Tanya Tania is about aspirations, sexuality, class differences, political ideologies and how they impact everyday people, gender differences, and of course, friendships. A heart-wrenching read, Tanya Tania is also a reminder of how two decades on, very little has really changed. The Boy Who Swallowed a Nail and Other Stories by Lalita Iyer: A fresh voice in kid lit, journalist Lalita Iyer’s memoir is reminiscent of the simplicity and innocence of childhood. Children will fall in love with her quirky family, where one day Appa is pondering about buying a buffalo much to the horror of the children, and on another, Ammini is telling an impressive story about a fart. It’s the little things that count – such as Amma’s habit of washing clothes in every hotel they stayed in during holidays or the description of foods such as aloo parathas with dollops of white butter and dahi. There’s even a recipe for this tomato jaggery chutney by Paatumami. Shamika Kocharekar’s illustrations are as happy as the stories. The tales are almost like sitting at your grandmother’s knees, listening to one anecdote, after another. Monkey Trouble and Other Grandfather Stories by Ruskin Bond, illustrated by Priya Kurian: There’s always a steady stream of old and new Ruskin Bond stories jostling for space on bookshelves. But now some of these stories have a new avatar with Priya Kurian’s splendid illustrations in the comic book, Monkey Trouble and Other Grandfather Stories. Kurian takes three of Bond’s stories – “Monkey Trouble”, “Eye of the Eagle”, and a “A Special Tree” and renders them in delightful colours. The most memorable one is “A Special Tree”, where a Ruskin Bond like grandpa encourages his grandson to sow a cherry tree seed and together they marvel at its growth through different seasons. 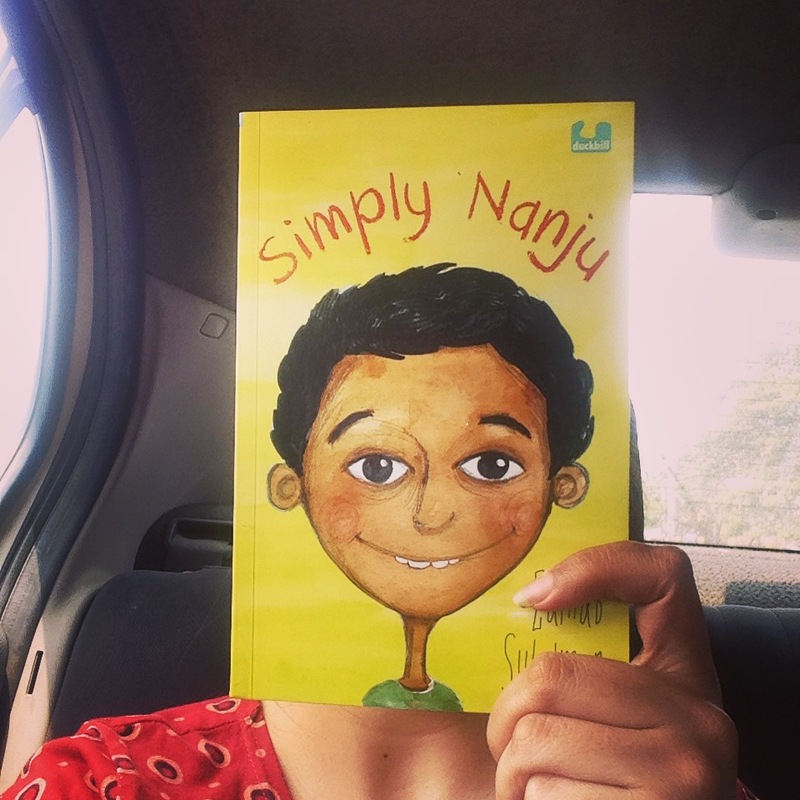 Simply Nanju by Zainab Sulaiman: Life isn’t easy for Nanju – he was born with a spinal problem and is often bullied at school. To make matters worse, Appa is threatening to send Nanju away if his marks don’t improve and someone’s flicking the topper’s notebooks in class, and Nanju is a key suspect. But the boy finds solace in his very smart best friend and plants. Zainab Sulaiman sets her story in a school for the differently-abled, writing about it with sensitivity and masterfully. Simply Nanju is about inclusion, but it’s also about class structures, bullying, and just navigating the bumpy path of school life. A Helping Hand by Payal Dhar and illustrated by Vartika Sharma (available on StoryWeaver.org.in): Miss has told “me”, the protagonist of the story, to be the mentor to the new girl in class and show her around. In a series of letters that are never meant to be read, the girl pours her heart out – about her reluctance to befriend the new girl because she’s different. At one point, she writes about a conversation with her older sister. “I told her, ‘There’s a girl in my class and she has a fake hand,’ and she said that the term is ‘prosthetic hand’.” Payal Dhar writes convincingly from the point of view of a child and has shades of empathy, bullying, discrimination, and inclusion. Vartika Sharma’s illustrations are hauntingly beautiful and stark, making the story a memorable one. Kasturba by Tanaya Vyas: The young Nina is quite an actor. She’s played all sorts of strong female protagonists – from Sita to Razia. But for her next play, Nina’s got the role of Kasturba. She can’t help but wonder about the role, after all she asks herself, Kasturba was only Gandhiji’s wife, wasn’t she? But when Nina starts preparing for the role, she finds out there was more to her than just being a wife. Thatha at School by Richa Jha and illustrated by Gautam Benegal: Delhi-based Oviyam may just be in second standard but she has a looming black cloud above her head. The school is celebrating their annual Grandparents Day and all grandpas and grandmas are invited. Oviyam’s embarrassed to bring her lungi-clad Thatha, but he’s ever-so excited about it. Richa Jha writes a wonderful, nuanced tale about a child’s relationship with her cherished, if sometimes embarrassing Thatha. Gautam Benegal’s illustrations are spirited and reflect Oviyam’s constantly changing moods perfectly.